The New Jersey Walkin Medical Center can help reduce or eliminate acne through a variety of treatment options. Some cases of acne can be relieved through oral medication, others respond to prescription lotions or creams, and laser may be best for your particular case and provide quick relief. 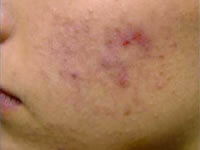 What Can New Jersey Walkin Medical Center Do To Help With Acne? Acne treatments focus produce an effect at various stages of acne production: reducing the production of oil causing acne, reducing the bacteria count, reducing the inflammation that’s associated with acne, speeding up the creation of new and healthy cells, or a combination of these. After an examination, the experienced doctors at our office can help you decide how to proceed and what results you can expect. How Long Will It Take To Eliminate My Acne? It may not be possible to entirely remove all your acne, and sometimes it can take as long as four to eight weeks before any improvement is noticeable. Part of this time may be spent finding the best treatment for your particular case because each of our bodies are different and what works for others may not work for you. How Do Topical Treatments Fix My Acne? Lotions made especially for the treatment of acne can act by killing the bacteria that may be causing it, by drying up the skin, and by causing the dead skin cells to fall off. While over-the-counter medications may help with some mild cases of acne, prescription lotions provide better results for more difficult cases. In some cases, a combination of therapy may produce the best results. Chemical peels, which are often used to improve sun-damaged or finely wrinkled skin, may help control acne as well. When used alongside other treatments, they often produce very good results. How Can Antibiotics Help Eliminate My Acne? Prescription antibiotics can be used to treat moderate to severe acne by reducing bacteria and the inflammation they can cause. It may be necessary to take the antibiotics for more than a month and you may also need to use them with a prescribed lotion. Can Laser or Light Therapy Help Treat My Acne? To treat both active acne and acne scars, laser or photodynamic light therapy are often an excellent choice. These treatments can treat the deeper layers of skin where the excess oil is produced or can kill the bacteria that cause the inflammation associated with acne. Since laser or light treatment can improve the skin’s appearance and reduce scarring, they are often the ideal way to treat both existing acne and its effects.